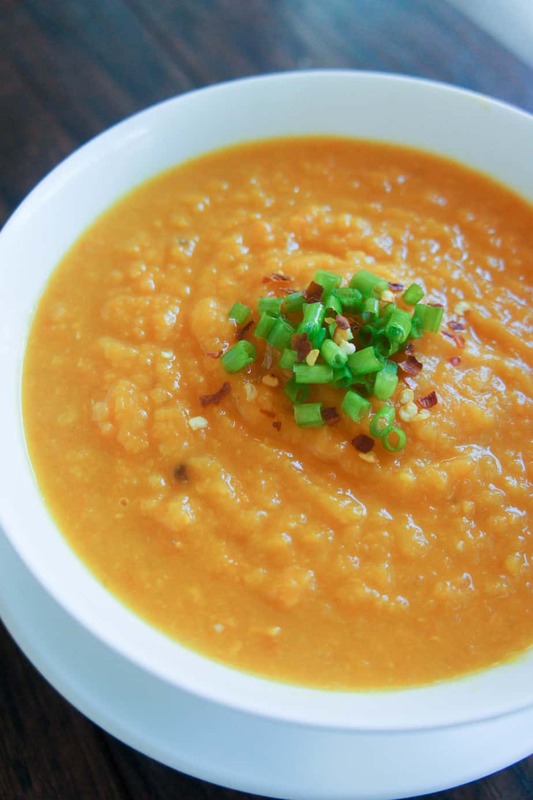 Carrot & Sweet Potato Soup… the perfect comfort meal for a chilly fall afternoon. I’ll admit. The initial idea of this soup wasn’t going to be carrot and sweet potato. I was really craving a butternut squash soup from Panera, but didn’t want to go get one. I didn’t have any butternut squashes on hand, and I didn’t really feel like going out. On a side note, why are they so darn expensive? Last time I bought one, I paid $13 for a medium sized squash. Seemed insane to me! But anyway, that’s not the point. The point is, I didn’t have any and I wanted soup NOW! So I opened the fridge drawer where I keep all my veggies and looked around. What could I possibly make that would resemble a butternut squash soup?! Out of the corner of my eye, I spotted some sweet potatoes that were going to go bad if I didn’t get to working with them. I figured I could make a sweet potato soup. I wanted to use up some other veggies though, so after a quick scan I found a few carrots and decided to throw those in there, too. Well, let me tell you guys, I was not sure what I was making. I had never tried a sweet potato and carrot soup (although after a quick search on Pinterest, I realized it is a thing), but I wasn’t opposed to trying it. It actually sounded quite appetizing! I thought of baking the carrots and sweet potato first, but then decided against that. As someone who hates doing dishes, eliminating any steps that require more washing is always a win! I went ahead and just dumped those in the same pot where I was cooking the rest of the soup ingredients. Where has this soup been my whole life?! I was quite impressed. The veggies cooked perfectly and the seasoning was pretty good, too! After a quick whirl in the blender (couldn’t find my immersion blender, whoops), I realized this looked exactly like butternut squash soup! It was actually pretty neat! And then was the moment of truth: tasting. Lo and behold, it tasted great! Different than squash soup, but good different. It was creamy and slightly sweet, but had more of a sweet potato taste! It was great (and MUCH cheaper than butternut squash). I still love a good squash soup, but this one is going to be on the weekly rotation this fall as well! If you make this recipe, be sure to use the hashtag #toeatdrinkandbemarried. I’d love to see it! Here’s a pin for ya! Pour the vegetable oil in the bottom of a large soup pot and spread around the surface. Heat the oil until it bubbles on high and then bring down to low heat. Saute the onions in the oil for 2-3 minutes until translucent. Add carrots and cook for another 2-3 minutes, adding little bits of water at a time if it is starting to stick or burn. Stir in the garlic for about 30 seconds. Add the sweet potato and vegetable stock and then simmer for 20-30 minutes, until the veggies are soft. Puree in a food processor or with an immersion blender until smooth. Season to taste and enjoy! Looking for another delicious soup recipe? This sounds so good. Perfect for fall! I love that you added ginger too. This sounds super good! It is the perfect thing to sip while cozying up with a good book this fall! I love carrot & sweet potato soup, has to be my favourite of all. I will need to make this tomorrow. Sounds like a super easy recipe. I’m going to try it tonight ! Great combination and something warm for these cool fall days. 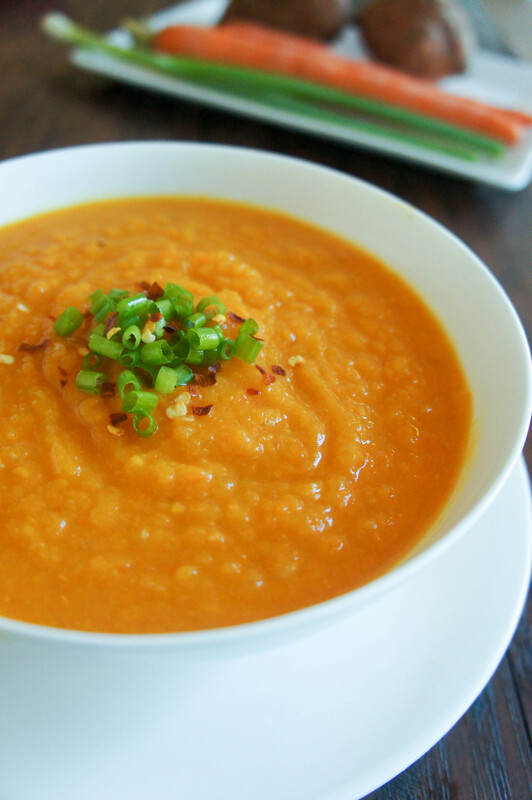 I rarely use carrots in my soups but I think if I was to puree it at then end, we would enjoy this carrot & sweet potato soup. It’s grocery day so I am going to pick up the ingredients to make this! Your recipes and photographs of cooked dishes are so tempting. Thanks for sharing. Homemade soup is so much better than bought and so much cheaper. In the UK these ingredients are pennies as they are in season now so I will be trying! Thanks! I agree! Both tastier and healthier 🙂 enjoy! Girl!! This sounds delicious. My kids aren’t super picky but I think I could get them to eat this. We love a good sweet potato (being in the South, it’s kind of our thing) and this sounds awesome. Thanks for the share ? Mmm, I love all things sweet potato. I would probably roast mine for more depth of that sweet carmelized flavor they get when roasted. I totally understand wanting to skip that step though, since it does take a while. This is the kind of soup I’d totally make during the fall season! Looks so great but healthy too! I am your new friend of blogger friend. 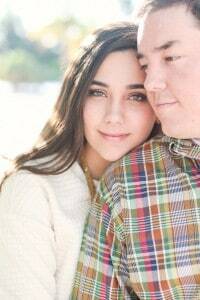 Your photos are awesome!!!! This soup looks so festive. Yum, I’m definitely going to try it! I love soup in Autumn!